I love Michael’s pictures for this. Just look at the front cover! 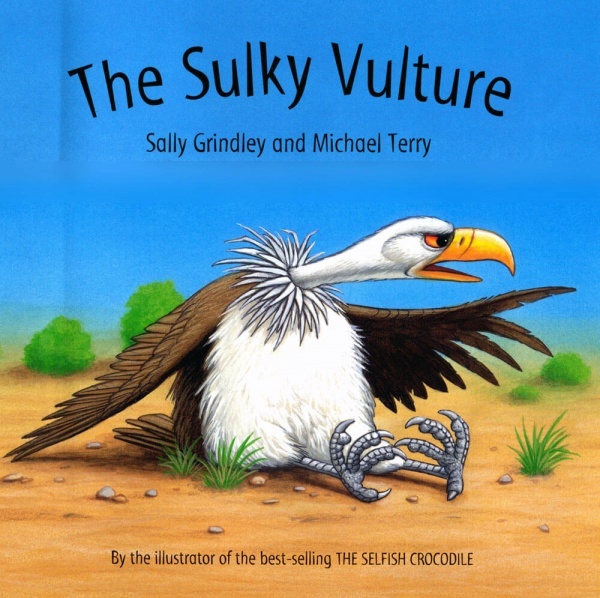 The story is about a young vulture called Boris who refuses to cheer up, no matter how hard his friends try to help out with games of chase and hide-and-seek. Everything goes wrong. By the end of a grumpy day, Boris needs a cuddle from Mum, but even that isn’t enough. 1) Have children take the role of Boris – putting heads down, hunching up shoulders, turning toes in and pulling grumpy faces every time it happens in the story. Great fun, especially in the classroom. Lots of photo opportunities! 3) Ask children to guess at what games Boris’s animal friends will suggest they play. 4) If you want to be even more interactive, divide your class into the different characters and act the story out! 1) Discuss things that might make people grumpy/sulky. 2) Discuss what you can do to cheer people up when they’re grumpy/sulky/unhappy. 3) What games might other animals suggest they play with Boris? 4) Where do vultures live in real life and what can you find out about them? 5) Discuss the other animals in the story and what do you know about them?